Recently, I wrote about my current top 14 subcompact 9mm pistols for concealed carry (CC), and some of you requested that I present my current top compact 9mm pistols for carry, so I am presenting them here in this article. I give comparative specifications for only 15 of the many compact 9mm models on the market now — just my opinions. Also, in this article I give you my top 10 criteria that you may want to use to save some time in developing your own criteria from scratch for selecting your CC gun. You may want to add or subtract from my criteria and modify them to include what's important to you. Most importantly, rent or borrow and try two or three of your "finalist" guns on your list before you buy your CC gun. I have shot all of these compact guns, own almost all of them, and have analyzed and compared their many features and factors to make informed decisions to buy the ones I want, based on my criteria, preferences and field tests. Hope it helps you. 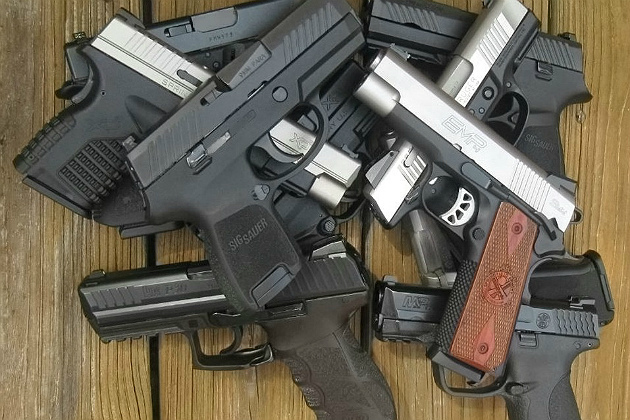 For this article, I arbitrarily narrowed down my many CC 9mm compact pistols to these 15. I could have considered more, but for this brief article I had to be concise. I compare them to many criteria, factors and features, and rank each gun within several categories, like weight-loaded, trigger press, price, etc. You can see in a side-by-side comparison how the guns compare and differ by factor. Knowing the specifications, factors and features of each gun before shooting your finalists will help you make a personal and informed decision. It does not really matter what your friends, family members, the "experts" or I say, since you have to know for yourself what works with your preferences, uses, idiosyncracies and shooting abilities. If you can specify what you want in your gun before you look at the many available guns, then you will usually make a more objective and effective decision. You won't bounce among the different guns that are being peddled the loudest by folks wanting to sell their particular brand or model. Be certain to compare like features and specifications among the guns you are considering. Below are some of my criteria for my CC compact 9mm handguns. As always, establish your own criteria, do your own research and check my data, information, and again most importantly, try the gun yourself. Here are just 10 of my criteria and factors I use for evaluating any handgun. In addition to my criteria, there are other subjective features that may be appealing for some, like a certain style, mag release location, action, caliber, appearance, number of mags included, type of sights/modifications, bore axis, rail, grip angle, nonporting or porting, included extras like a holster and pouch, customer service, etc. I combined these into my last Miscellaneous criterion. 1. Accuracy and reliability: How accurate is it out of the box, without any modifications (and costs) like trigger job, different sights, grips, springs, etc.? Is itreliable (defined by me as consistency of good hits over repeated trials)? Durability is another factor. It must perform well without reoccurring malfunctions and stoppages, resulting in consistent, accurate target hits with a 3-inch hit group or so at 5-15 yards for concealed carry. 2. Trigger press: What is the force necessary for the trigger press? There is a big difference between a 4.5- and 7.5-pound trigger press for results. Is the trigger smooth and crisp? Themaxiumum should be about 5.5-6.5 pounds, which lessens the force applied for less movement and better accuracy. The press should also be crisp and identifiable. 3. Trigger: What about the reset distance for follow-up shots? Does it have a long or short travel, and is the reset point readily identifiable? Look for one with a short travel distance (which increases the speed the trigger can be fired) and easily identifiable and short reset point. A trigger with a smooth consistent press for every shot means less need to transition between presses and make adjustments. 4. Barrel: Aim for a length of 3.0-4.5 inches, though the width of the gun and its grips are more important to me than the barrel length for concealed carry purposes. While both are important, I do not want the wider gun to bulge at my hip line when I carry, like most revolvers do for me. Of course, there is a difference between a 3-inch barrel and a 6-inch barrel when carrying, and method of carry affects this. 5. Sights: You want basic and simple here (easy to use and see — I like fiber-optic fronts). I look for fast target acquisition; for my purposes — adjustable for windage; use night sights for low-light situations. 6. Weight: Find a proper gun weight to minimize recoil. I prefer about 25 ounces or less for carry, but there are trade-offs. 7. Caliber: Match it to your needs, characteristics and abilities (consider your medical and physical limitations). 9mm is my preference for carry. 8. Capacity: Make sure it's adequate for your use. I usually prefer at least 8-10 in a 9mm magazine for carry (but can carry a spare mag or two sometimes). 9. Ergonomics: Hand comfort and grip fit are key here. Find controls that are easy to work and easily accessible — rounded, low profile. 10. Miscellaneous: This includes overall finish, fit, quality, appearance and workmanship; mag release location; ambidextrous controls; accessory rail as required; grip angle; bore axis; competitive market price; excellent customer service with friendly and helpful representatives; ease of disassembly-assembly; hard case; extras (third mag, holster, pouch, extended and flush mags); warranty length and extent; etc. 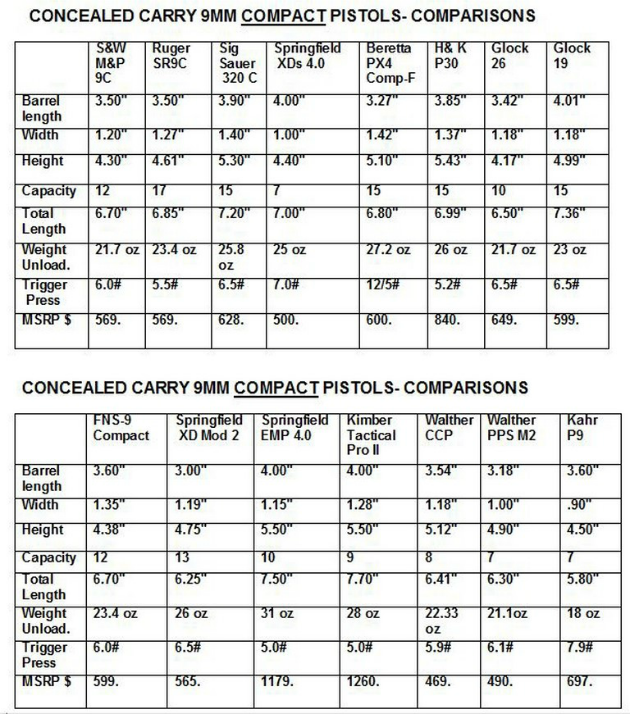 Here are the specifications for 15 current CC compact 9mm handguns, for your consideration. Remember, to also consider your personal preferences, features, etc. and to shoot your final guns before your selection. I have shot these guns previously using the drills in my book and my protocols. For my use, skills, criteria and preferences, I have found each of these compact handguns to be accurate and reliable. I rotate among six of these compact guns for my everyday carry (EDC), as necessary and appropriate. So safely shoot these guns for yourself to make your own decisions, before you buy. For this brief follow-up range test that supplements my previous range tests and drills, I fired a total of 10 rounds of quality Sig Sauer Elite Performance V-Crown 9mm FMJ and JHP ammo in 115 and 124 grains for each of the 15 compact guns. For each gun, I shot five rounds of 115 grain FMJ and five rounds of 124 grain JHP from a standing Modified Isosceles Position, with a two-handed grip at 7 yards on IDPA targets. Understand that this brief, supplemental field test is just a partial indicator of accuracy and reliability of the guns and ammo, so do your own range test with more ammo and thorough drills. This supplemental range test, when combined with my previous range tests firing many rounds in each gun, supports my accuracy and reliability conclusions. My best rapid-fire individual groups were 1.90" from the 124 grain JHP and 2.0" from the 115 grain FMJ. Practice! Practice! Practice! It is important to initially establish your own criteria, identify your personal desired features, and rank your priorities and preferences, beforeyou even begin searching for your compact 9mm CC gun. By being organized and knowing up front what you want in your carry gun, you will more easily recognize it from the many guns in the market. There are so many choices that you can get sidetracked and bounce from one gun to another. So, have a plan and do the necessary work before shopping. Research and identify the several characteristics, features, pros and cons, and match them to your criteria. You will probably have to make your own tradeoffs according to your goal, desired features, preferences for certain factors, etc. We all want all of our criteria to be met, but realistically maybe only eight or nine of our 10 criteria can be met by any one gun. There is not one perfect CC gun for everybody. That is why I have more than one CC gun, but you have to practice with your chosen guns and know how to effectively operate them. Maybe for most (especially new shooters) having multiple CC guns is not optimal, if they do not devote the necessary time to practicing and adapting to their differences. Some can easily and quickly switch from using an SAO gun with a manual safety to a DAO without a manual safety, because they truly understand the key differences, regularly practice with them, and can develop and apply the proper skills and techniques as required. However, it takes much practice and training for this. I hope this article has helped you gain some information you did not previously have about these 15 possible CC compact 9mm handguns. As always, I recommend that you shoot any handgun yourself before you purchase it. Decide on your criteria, how you will primarily use the gun, and what features are important to you and you are willing to pay for before you go shopping and before your range time. Then, critically evaluate the gun yourself per your criteria and purpose using standard drills, with various ammo types and brands, over an extended break-in period of about 500 rounds. Remember, safety first always. Continued success! © 2016 Col Benjamin Findley. All Rights Reserved. This article may not be reprinted or reproduced in whole or in part by mechanical means, photocopying, electronic reproduction, scanning, or any other means without prior written permission. For copyright information, contact Col Ben Findley at ColBFF@gmail.com.